Penguins are excellent navigators. 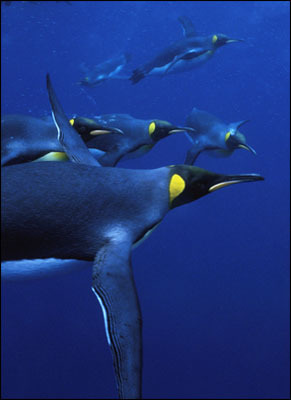 Emperor penguins, for example, are not only capable to cover hundreds of kilometres on ice and locate purposeful a near ice border, but they can also find their way back to their colony after a long time of absence. For this orientation they need to be capable to recognise and memorise certain characteristics, like icebergs and mountains, of the surroundings and the moon and stars. But the weather in Antarctica is often very windy and the sight during a snowstorm minimal, and out at sea they often swim in new, unknown territory. So there must be another way for orientation. Just as for a lot of other birds too, their navigation tools are hearing, smelling and magnetism. A lot of birds can smell very good and so recognise where they are. By the sound of the breaking of the sea they locate the shores. And their sense for magnetic fields is so strong that they use it as a compass and map, but it is also very sensible to magnetic intensity, so they know where they are and where to go.